It’s official. Summer has started for me. This weekend was full of eating outside on patios with the hubbs, running outside and taking a stroll with my best friend eating ice-cream from Cold Stone. I also got two big projects done which I will post on later. Surprise!! Also – my boss sent me this picture from Japan. If you don’t know already, I work for a Japanese company here in Atlanta and my boss and his family were transferred back to Tokyo. I talked about how much I wanted to go to the Cherry Blossom festival there so he sent this picture. Evidently there are over 250 of these trees lined up along this road. This is Julie. She has many "roles"... my co-worker, project buddy and craigslist spouse. This past “Project Sunday”, Julie and I tackled painting over her green marble fireplace with a product called “Gripper” (you can find it at Home Depot). We got the can of white instead of gray but I’m sure either works. Anyway – it went on great and was super easy! The only issue we had was that some staining from the marble was coming through the paint a little so after the Gripper dried, we painted over those spots with some heavy duty Kiln’s. That seemed to do the trick and we finished it off with some interior white paint. It looks so classy now don’t you think? Doesn't the new paint look nice? What you can't see is the green marble from before... yup, green! You’ll notice some blue and green tape on the yellow bookcases in the background. 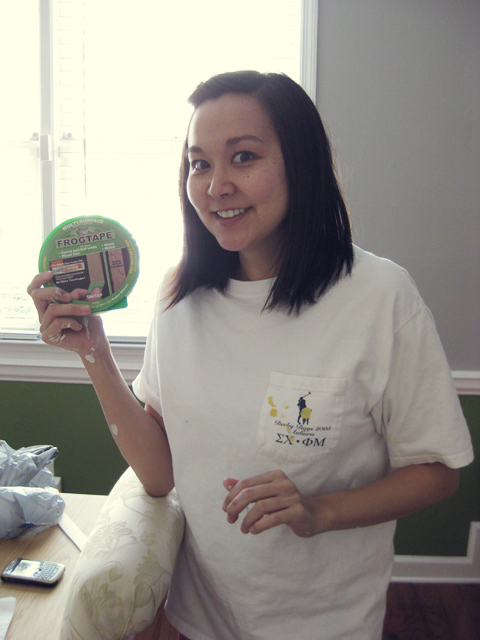 We were trying this new tape for painting called Frog Tape. Supposedly, it’s supposed to prevent the paint from being pulled up after it dries (you all know what I’m talking about, pain!). It definitely didn’t pull up but neither did the tape! We’re going to give it another go to see if there’s some kind of finesse to pulling it off the wall properly.